A close look at an uncommon autoimmune disease. A 72-year-old Caucasian man presented to our office for cataract evaluation. His chief complaint was blurry vision. His medical history was positive for type 2 diabetes mellitus, well-controlled with metformin, and hypercholesterolemia. He denied smoking and reported occasional alcohol consumption. The patient’s BCVA was 20/40 in the right eye (OD) and 20/50 in the left eye (OS). IOP at presentation was 14 mm Hg OD and 15 mm Hg OS. External examination revealed 2+ dermatochalasis and poliosis along the upper lashes of each eye (OU) (Figure 1). Pupillary and motility examinations were within normal limits. Anterior segment examination was significant for mutton-fat keratic precipitates and 2+ nuclear and 2+ cortical cataracts OU. Dilated posterior segment examination revealed optic disc hyperemia, macular edema, and diffuse focal retinal pigment epithelium (RPE) dropout in the macula (Figure 2). Peripheral examination demonstrated diffuse RPE atrophy and depigmentation, with areas of focal RPE scarring (Figure 3). Figure 1. 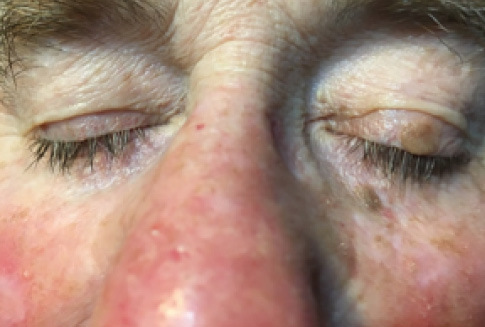 Photograph shows 2+ dermatochalasis and poliosis along the upper lashes OU. Figure 2. 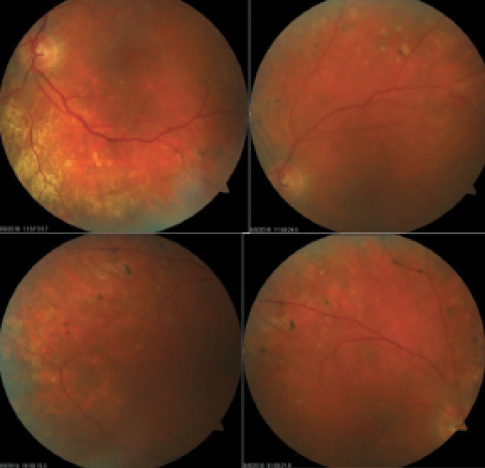 Posterior pole fundus photography demonstrates optic disc hyperemia, macular edema, and diffuse focal retinal pigment epithelium dropout in the macula OU. Figure 3. 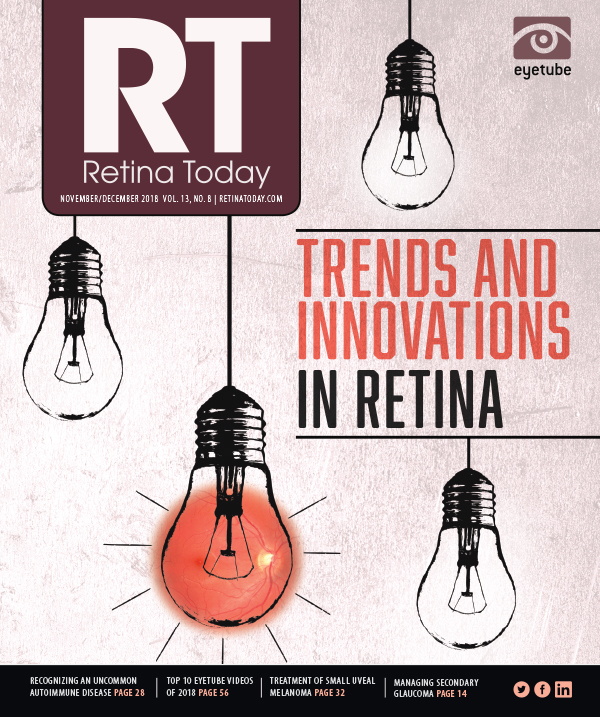 Peripheral fundus photography demonstrates diffuse RPE atrophy and depigmentation with areas of focal RPE scarring OU. Figure 4. OCT shows macular edema OU. Figure 5. OCT demonstrates a Dalen-Fuchs nodule OD. Figure 6. Fluorescein angiography demonstrates diffusely scattered dots of hyperfluorescence caused by window defects at the level of the RPE, moderate macular leakage, and disc leakage OU. 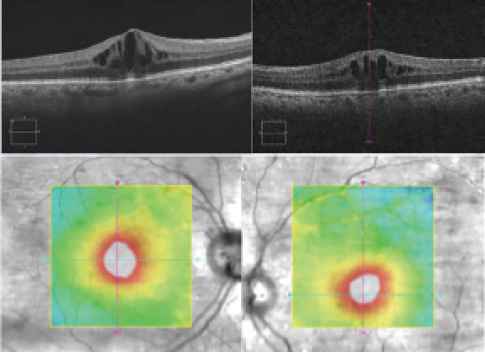 OCT revealed macular edema OU (Figure 4) and a Dalen-Fuchs nodule OD (Figure 5). Fluorescein angiography demonstrated diffusely scattered dots of hyperfluorescence caused by window defects at the level of the RPE, moderate macular leakage, and disc leakage (Figure 6). Review of systems was positive for hearing loss, tinnitus, dizziness, and neck pain. The patient reported no nausea, vomiting, fever, chills, fatigue, chest pains, new rashes, joint pain, weight loss or gain, cough, or recent travel. He also reported no prior ocular trauma. Uveitis workup, including antinuclear antibodies, angiotensin-converting enzyme, erythrocyte sedimentation rate, C-reactive protein, rheumatoid factor, HLA-B27, and titers for toxoplasma, sarcoid, Lyme, and toxocara was negative. Differential diagnosis with these ocular and systemic findings includes sympathetic ophthalmia, central serous chorioretinopathy, posterior scleritis, acute posterior multifocal placoid pigment epitheliopathy, and Behçet disease. We believe this patient to be in the convalescent stage of Vogt-Koyanagi-Harada (VKH) disease and will plan treatment accordingly. • Variant 1: Patients presenting with criteria A, B, C, and D1. • Variant 2: Patients presenting with criteria A-C as well as D2 and D3, or D4. • Variant 3: Patients already treated with systemic corticosteroids with or without immunosuppressive agents who have a history of typical appearances of variant 1 or 2 as well as criteria A-C and D5. Likewise, late phase VKH is divided into three variants. • Variant 1: Patients presenting with criteria A-C as well as E1 and E2. • Variant 2: Patients presenting without sunset glow fundus or visible pigment alterations; criteria A-C, E2, and either E3 or E4 must be met. • Variant 3: Patients presenting with significant media opacity, requiring criteria A-C, E2, and E5. VKH presents in four clinically distinct stages: prodromal, uveitic, convalescent, and chronic recurrent.1 The prodromal stage occurs during the first 3 to 5 days of the disease process and is characterized by neurologic findings such as tinnitus, neck stiffness, and hearing loss. Examination of cerebrospinal fluid will reveal lymphocytic pleocytosis, which can last several weeks. • Vogt-Koyanagi-Harada (VKH) disease is a multisystem autoimmune inflammatory disorder with neurologic, skin, auditory, and ocular manifestations. • Treatment of VKH disease involves the use of an immunosuppressive agent with steroidal and nonsteroidal therapy. • Early diagnosis and treatment of VKH disease is key for optimal clinical outcomes and potentially complete remission of the disease. A review of 32 patients at a tertiary uveitis clinic in Turkey provided some understanding of symptom distribution for VKH.7 Sixteen patients (16%) presented with acute uveitic disease, four of whom (25%) experienced recurrent inflammation. Of those with acute uveitic disease, 75% experienced exudative retinal detachment with optic disc edema or hyperemia, and the other 25% presented with only optic disc involvement.7 Perhaps the most important finding of this study was that only 31.2% of patients experienced all three manifestations of the disease (dermatologic, neurologic, and ocular). Caution should be used when treating ocular pathologies in patients with known VKH. Ranjan and Agarwal reported rebound inflammation in 43-year-old man treated with bevacizumab (Avastin, Genentech) injections for subfoveal choroidal neovascular membrane.11 Oral corticosteroids and immunosuppressants led to a resolution of his rebound exudative retinal detachment and keratic precipitates. VKH disease is an uncommon autoimmune disease with a relatively well-defined clinical course. 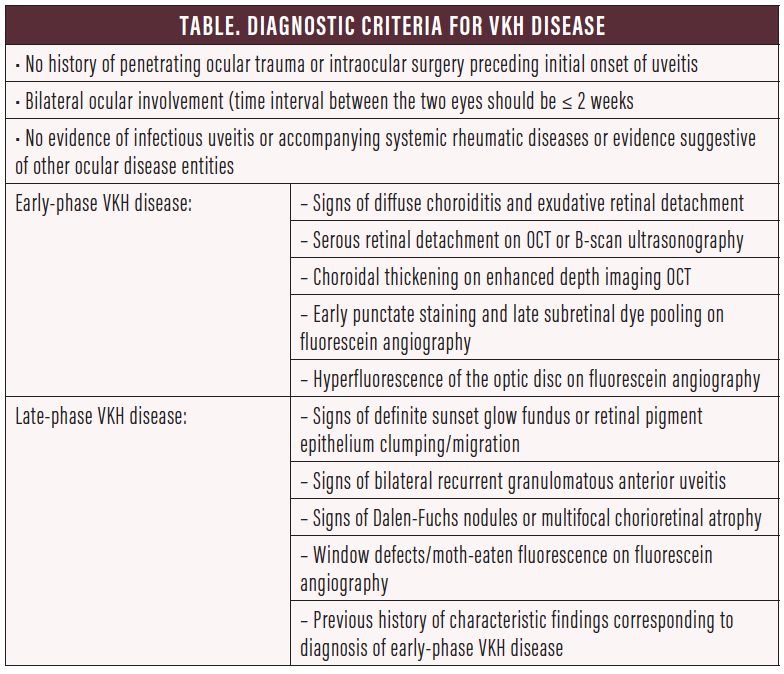 Clinical symptoms are currently the only way to diagnose VKH. Early diagnosis and treatment are key for optimal clinical outcomes and potentially complete remission of the disease, but all patients with VKH can benefit from a combination of steroidal and immunosuppressive therapies. 1. Burkholder BM. Vogt-Koyanagi-Harada disease. Curr Opin Ophthalmol. 2015;26(6):506-511. 2. Cunningham ET, Rathinam SR, Tugal-Tutkun I, Muccioli C, Zierhut M. Vogt-Koyanagi-Harada disease. Ocul Immunol Inflamm. 2014;22(4):249-252. 3. Xu M, Wang C, Tian Y, Kijlstra A, Yang P. Inhibition of proinflammatory cytokine by IL-25 in Vogt-Koyangi-Harada syndrome. Ocul Immunol Inflamm. 2014;22:294-299. 4. Nakayama M, Keino H, Watanabe T, Okada AA. Clinical features and visual outcomes of 111 patients with new-onset acute Vogt-Koyanagi-Harada disease treated with pulse intravenous corticosteroids. [published online ahead of print April 17, 2018]. Br J Ophthalmol. 5. Jabs DA. Improving the diagnostic criteria for Vogt-Koyanagi-Harada disease [published online ahead of print July 5, 2018]. JAMA Ophthalmol. 6. Concha-Del Río LE, Gómez L, Arellanes-García L. Corticotherapy vs. corticotherapy plus immunosuppressive therapy in acute Vogt-Koyanagi-Harada disease. Arch Soc Esp Oftalmol. 2018;93(5):225-230. 7. Ozdal P, Ozdamar Y, Yazici A, et al. Vogt-Koyanagi-Harada disease: clinical and demographic characteristics of patients in a specialized eye hospital in Turkey [published online ahead of print December 11, 2013]. Ocul Immunol Inflamm. 2014;22:277-286. 8. Herbort CP, Abu El Asrar AM, Takeuchi M, et al. Catching the therapeutic window of opportunity in early initial-onset Vogt–Koyanagi–Harada uveitis can cure the disease [published online ahead of print June 11, 2018]. Int Ophthalmol. 9. Yang P, Ye Z, Du L, et al. Novel treatment regimen of Vogt-Koyanagi-Harada disease with a reduced dose of corticosteroids combined with immunosuppressive agents [published online ahead of print November 7, 2017]. Curr Eye Res. 2018;43(2):254-261. 10. Budmann GA, Franco LG, Pringe A. Long term treatment with infliximab in pediatric Vogt-Koyanagi-Harada disease. Am J Ophthalmol Case Rep. 2018;11:139-141. 11. Ranjan R, Agarwal M. Rebound inflammation after intravitreal injection in Vogt-Koyanagi-Harada syndrome. Indian J Ophthalmol. 2018;66(6):863-865. 12. Rutzen AR, Ortega-Larrocea G, Frambach DA, Rao NA. 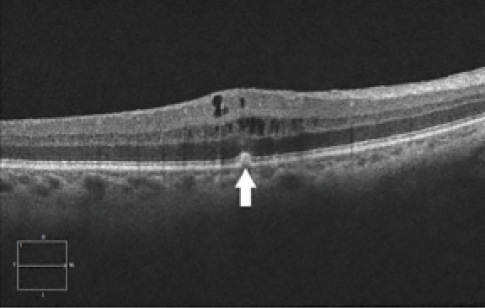 Macular edema in chronic Vogt-Koyanagi-Harada syndrome. Retina. 1995;15(6):475-479.